Throughout the ages and across cultures, there’s surprisingly little variation in how the beauty of the male physique has been perceived and measured. 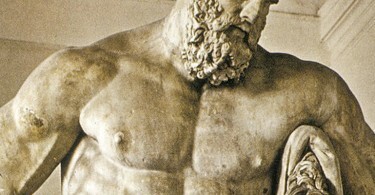 The overall SIZE of the ideal male may change from one era to the next or from one civilization to another, but the RATIOS remain remarkably similar. How do we know this? Because our colleague John Barban has done the legwork for us. He has conducted extensive research on how the ideal male physique has been defined across centuries and cultures. And he’s distilled it all down into a comprehensive formula that predicts the desirability of a male physique based on ratios between a specific set of body measurements. He calls it the Adonis Index. Not surprisingly, one of the most important aspects of the Adonis Effect — your Adonis Index determines the effect that your physique will have on others — is the width of your shoulders in relation to other body parts. In this video John shares some simple but effective exercises that you can do to change your Adonis Index at home with nothing but a couple dumbbells. Depending on your height, you’ve got an ideal waist size. And depending on your waist size, you’ve got an ideal shoulder width. If you hit those numbers correctly, voila! You’ve tapped into a psychological factor of attraction that John calls the Adonis Effect. But no matter what you want to call it, rest assured that you’ll be more attractive to the ladies in your life and you’ll garner more respect from other guys. Cool, eh? If you’ve got any questions for John, please drop them into the comments section. He’ll be back on Sunday with some more great shoulder exercises. According to the Adonis Index, my ideal shoulder width is 48 inches. My chest, however, is already 48 inches, “a natural 48” according to my tailor, which means that it will not shrink with weight loss. What advice do you have for me? where do i find the Adonis Index? BTW – How do y’all like the new blog design? How many days a week do I have to train with the Fuzion workout?I would like to train 3 days a week. Hello: Just turned 48 and have been more sedentary than active for quite a while. I do walk quite a bit and up and down hills and steps. That’s about it for exercise. My blood sugar was within normal limits but on the higher side of of the range, LDLs were a little high as was HDL/LDL ratio. Cortisol was also too high. On a Tanita scale my bodyfat was 26%, too high, and on the low end of obese, although I don’t look anything like “obese”. Most people tell me I look about mid-30’s and basically I look and feel pretty good. I don’t take any medications at all and that’s a big plus as compared to most people my age. I got thinking lately that I used to be very active and could I do it again. I would like to make over my body and health and have age 50 as my goal to be in great shape again. That gives me 2 years to get some type of program going. I keep a picture of myself at age 17, totally without a shred of fat playing basketball as inspiration. It would be unhealthy for me to be that skinny again but it would be great to get down to 15-16% bodyfat again. Any ideas on getting started? I like the idea of body weight workouts. I’m usually the one coaching other people to better health. Now I need someone telling me, “You can do it and I can help”. Anyone out there? It would make a great testimonial for you guys too! Congrats on taking the bull by the horns. That’s a great goal, and a great gift to give yourself when you turn 50. Everyone is different, but one of the best places to start might be our Scorpion 75. We’re giving it away free today (January 7th) with Kim Lyons’ Fast Track To Fat Loss membership. But it’ll also be available in a month or two on its own. The real key though is consistency. Pick an exercise plan, a nutrition strategy and a lifestyle that you find sustainable and stick to it. Keep us posted! Needed to post you the bit of word to help thank you so much again regarding the pleasant advice you’ve discussed here. make some bucks for their own end, particularly seeing that you could have done it if you desired. several more enjoyable periods up front for folks who looked over your blog. is a very superb website. I carry on listening to the news update lecture about getting boundless online grant applications so I have been looking around for the best site to get one. What i do not understood is in reality how you are no longer really much more smartly-preferred than you may be now. topic, made me individually believe it from numerous numerous angles. to valuable to contribute to the discussion. It is a result of the passion displayed in the post I read. 😛 I do have 2 questions for you if you tend not to mind. Would you make a list all of your community sites like your twitter feed, Facebook page or linkedin profile? certain to don’t omit this site and provides it a glance on a constant basis. I merely wanted to thank you yet again for your amazing blog you have developed here. long and tips might be put to good use. This page truly has all of the info I wanted about this subject and didn?t know who to ask. hoped for before you know it in the least. I conceive other website owners should take this internet site as an model, very clean and superb user genial style.